Casino Tropez performs an aggressive marketing campaign, promoting bonuses up to €3000! But how hard is it go claim the full bonus? And what criteria have to be met to be eligible to cash that bonus? That is what we are going to find out in this article. As always, Casino Bonus King makes bonuses transparent and provides honest information about casino promotions. Your first deposit at Casino Tropez will get rewarded with a 100% deposit bonus in 2011. This bonus is limited to a maximum of €100, so in order to get the maximum amount, you have to deposit at least €100 into your account.High rollers get a special treatment: a first deposit of €1000 is rewarded with a special bonus of €500. 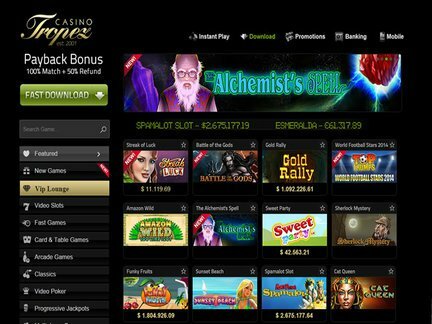 In order to clear your first deposit bonus, you will have to wager at least forty times the bonus amount. In other words, the maximum bonus of €100 requires you to wager at least €4000. Unfortunately, not every casino game counts. Baccarat, Roulette, Sic Bo, Darts, Heads or Tails, Video Poker, BlackJack Switch, BlackJack Surrender, Pontoon, and Craps are not valid to clear your bonus amount. In other words, when you are going to play one of those games, the first deposit bonus is no good for you. Your second deposit will be rewarded with a 50% bonus, with a maximum of €200. So in order to receive the maximum benefits of this bonus offer, you will have to make a second deposit of €400. The bonus amount has to be wagered at least 60 times. For example, when depositing €400, you will receive a €200 bonus that will be cleared after wagering at least €12,000. The same rules as the first deposit bonus apply regarding valid games for clearing. Every customer that made its first deposit after October 21, 2007, can claim a special Sunday bonus. This bonus will only be received when you make a deposit at a Sunday, between 0:00 and 23:59 casino time. After claiming you first Sunday bonus, you will be eligible for this bonus for the next 27 weeks, every Sunday again. This means that you can claim this bonus for a maximum of 27 times. Every bonus has the amount of 100% of the deposit, with a maximum of €100. This means that you can claim in total 27 times €100 bonus, resulting in a combined total of €2700. Before being able to cash out the bonus, you will have to wager it at least 80 times. Combining the three bonuses mentioned in this article, the total maximum amount adds up to €500 (high roller first deposit) + €200 (second deposit) + €2700 (27 Sundays) = €3400. The total wagering requirement for this bonus is €20,000 + €12,000 + €216,000 = €248,000.